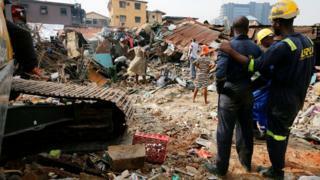 Na about 36,000 buildings na im fit soon collapse for Lagos, Nigeria, according to Di Building Collapse Prevention Guild of Nigeria (BCPG). Di President of BCPG, Akinola George tell BBC News Pidgin say dis na because most buildings for Lagos no be pipo wey dem properly train to dey build am. Oga George say most of di buildings dem for Lagos no dey properly procured. "Procurement of building na long process, you need to use di right professionals, di right materials, get di correct approval from goment and no allow quacks design or supervise di building work." "Di building control from goment suppose to be from everi stage of di construction implementation process. All dis na tins wey dey come togeda to produce reliable stable building. If pesin no go through di right process and im use quacks, wrong materials and wrong construction method, di pesin building go definitely get collapse." Only for dis Month of March, na at least 3 building don collapse for Lagos and at least 20 pipo die. Base on dis, di state goment don earmark 45 building wey dem wan demolish afta dem find out say di building dem no too strong. "45,000 building na im dem dey construct everi year for Lagos alone legally or illegally but di professional wey dem train for construction no dey involve for more than 20% of all dis. "And 80% of 45,000 na 36,000. So if 36,000 no dey properly procure e dey likely for dem to collapse. So correct building procurement na im be di key." Mr George say among all di 36 state for di kontri , Lagos state get di highest number of building wey dem dey build and also di greatest number of collapse. E say Lagos state no get di personnel capacity to monitor all dis sites but di building professionals (like Architect, Engineers, Town planners, Quantity surveyors, builders, estate valuers and land Surveyors) for Nigeria plenty well-well for di state. So make Lagos state take dis advantage and dey use dem take monitor and make sure say pipo build well. For one press conference on Monday, di BCPG advise Lagos State goment to pay serious attention to buildings for Lagos Island, Oworoshoki/Bariga, Somolu, Ebute Meta, Mushin, Ajegunle, among odas, to identify all those buildings wey no stand well. 199 pipo die inside Nigeria for four building dem wey collapse between 2014 and 2016, according to di Nigeria Building and Road Research Institute.